Manufacturing and delivery of custom plastic panels within 48 hours of order confirmation is possible due to a new partnership between Vention and Groupe PolyAlto. Besides automatic 3D design of panels based on surrounding geometries, Vention’s cloud-based MachineBuilder is said to enable real-time pricing of cut-to-size panels. Image courtesy of Vention/PRWeb. MONTREAL—Vention, a digital manufacturing platform dedicated to machine design, has formed a partnership with plastics fabricator Groupe PolyAlto for the manufacturing of custom plastic panels through a digitally integrated workflow. The companies say their alliance will enable users of the Vention cloud-based machine design platform to design and order cut-to-size plastic panels for delivery within 48 hours of order confirmation. Here’s how it works: Customers can choose from an initial selection of nine plastic materials, including high-density polyethylene (HDPE), polycarbonate (PC), acrylic, and phenolic C. The Vention cloud-based MachineBuilder allows for automatic creation of a custom plastic panel based on surrounding geometries. Digital integration between Vention and Groupe PolyAlto ensures that panels are priced in real time, and confirmed orders are then routed directly to the proper manufacturing equipment at Groupe PolyAlto. The digital workflow is said to remove all of the traditional steps of 3D design, manual quoting, CAD file exchange, and order processing. “The digital integration with Groupe PolyAlto represents a first step in making Vention’s MachineBuilder a high-speed design and purchasing platform for modular, as well as custom, industrial equipment,” said Etienne Lacroix, founder and CEO at Vention, in a release announcing the partnership. Vention (www.vention.io), reported to be the first digital manufacturing platform dedicated to machine design, was founded in 2016 by former mechanical and software engineers from General Electric, McKinsey & Co., Microsoft, VMware, and Pivotal. 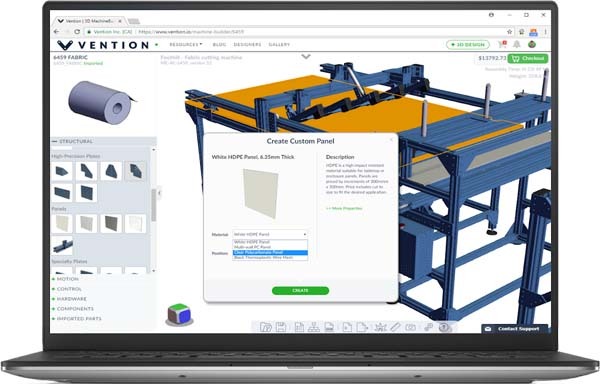 Aiming to become “a central tool within the machine design ecosystem,” Vention provides a fully integrated 3D MachineBuilder™ and modular component library that enables users to design, order, and assemble custom industrial equipment directly from a web browser in just a few days. Groupe PolyAlto (www.polyalto.com) is reported to be the largest fabricator of plastic products in Eastern Canada. Although Vention and Groupe PolyAlto currently support nine different plastic materials through their digitally integrated workflow, they expect to expand the portfolio of plastic panels in the near future, the companies said.